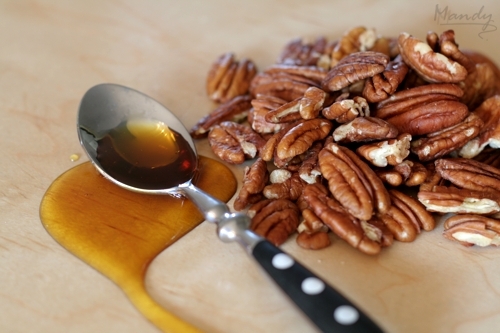 Maple & Pecan — What the Fruitcake?! 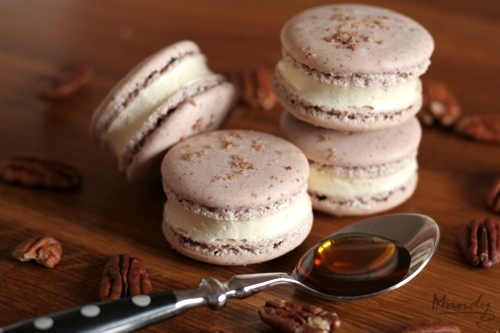 Yet another macaron that has come about while participating in the October Daring Bakers challenge :) I wanted to play around with using another kind of nut in the meringue as it's quite popular to sub half of the almond meal for pistachio or another kind of nut meal. I love pecan nuts so which kind of nut I would be using was an easy choice. When roasted, they've got a lovely rich flavour and an amazing smell. One of my favourite desserts is pecan nut pie! I thought maple syrup would be the perfect partner, it's like ham and cheese, lamb and mint; maple & pecan just go well together. 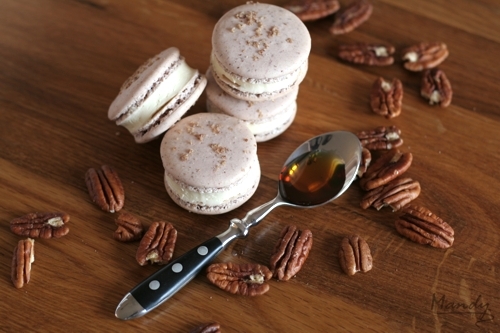 The one thing about macarons is that you need the ingredients to be as dry as possible so I processed the pecan nuts as fine as I could, passed the meal through a sieve and then left the pecan meal to dry out over night. Process the confectioners sugar, almond meal & pecan nut meal until the nut meal is fine then sift into a medium bowl. Fold half of the nut meal mixture into the meringue, starting quite vigorously then folding more carefully. Posted on October 27, 2009 by Mandy Mortimer and filed under Baked, Sweet and tagged Macaron Maple Buttercream Pecan Nut.